Simon is a young, orphaned chimpanzee who was taken from the wild and sold as a pet. He has lived on his own in a barren cage with only a football for company for more than a year. Thought to be just three to four years old, we think Simon, a western chimpanzee, was born in a national park in southern Guinea-Bissau. We were alerted to Simon's plight after a supporter shared their concern for him via our Captive Animal Report form. Volunteers kindly provide Simon with water, food and blankets and his owners have been convinced to let him out of his cage sometimes. We urgently need your help to give Simon a lifetime home at the Sweetwaters Chimpanzee Sanctuary in Kenya, which is a refuge for orphaned and abused chimps from West and Central Africa. Will you please help us give Simon a life worth living? The good news is that Simon’s owners have agreed to let him move to a sanctuary where he will have a permanent home surrounded by other chimps. We are working with the Pan African Sanctuary Alliance to rescue Simon and transport him to Sweetwaters Chimpanzee Sanctuary. The sanctuary is currently home to nearly 40 chimps who have been rescued from appalling conditions. At Sweetwaters they are given expert veterinary care and enjoy a life free from harm in vast, natural enclosures in which they can explore, climb and socialise – living the life a chimp should. With your help we can fund Simon’s rescue, relocation and initial care at Sweetwaters. 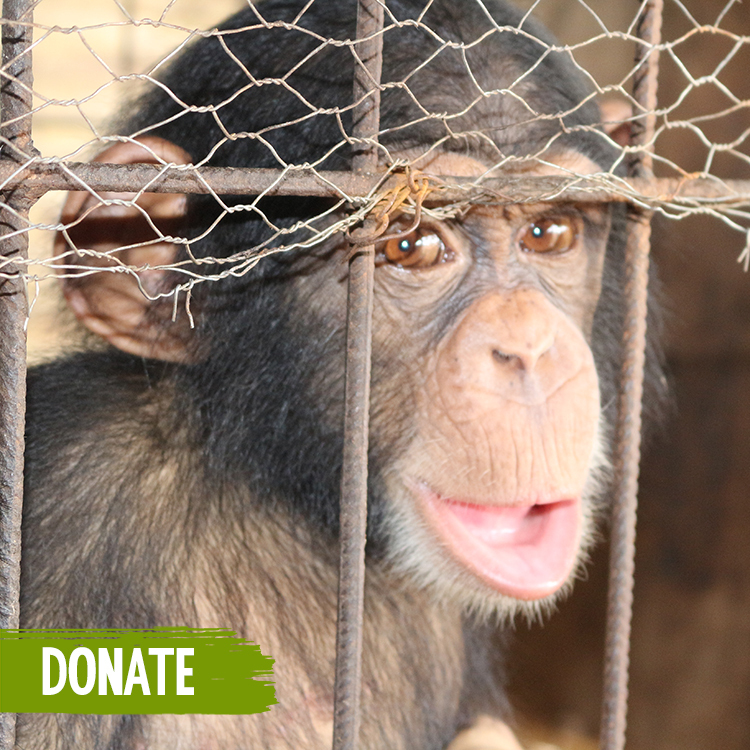 Any additional funds we raise will be used to help fund the rescue of other chimps. Simon has had the worst possible start to life, but together we can give him a brand new start at Sweetwaters. Will you please help us?